Please refer to our stock # T1836 when inquiring. Large bold big juicy purple 7/8" - 22mm X 16mm real purple faceted gem at center as the pendant. All real, never faux! 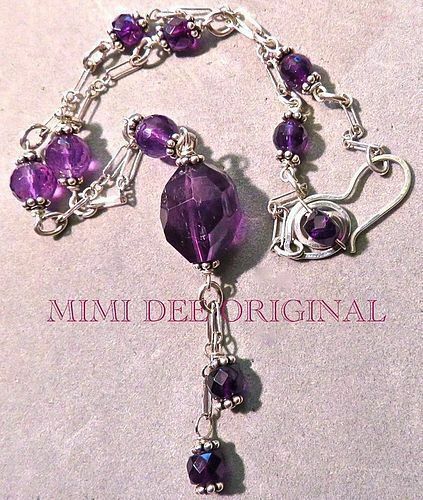 The fancy hook is hand forged,hammered, signed with another plum gem added to it. This signed studio metalwork jewelry artist who also paints oils/ acrylics, has made fiber art to wear garments in the past and does not duplicate, has exhibited in various juried shows, more recently since the 90s and at the previously open Methuen studio store gallery by the same name.